In this week’s study from Tehillim / Psalms 121:1-8, the psalm opens saying, א שִׁיר לַמַּעֲלוֹת אֶשָּׂא עֵינַי אֶל-הֶהָרִים מֵאַיִן יָבֹא עֶזְרִי: 121:1 I will lift up my eyes to the mountains; From whence shall my help come? (NASB) Is the Psalmist asking a rhetorical question? (Rhetorical is -of a question- asked in order to produce an effect or to make a statement rather than to elicit information.) Why does he look to the mountains? Is it because of the high places in which Israel sacrificed and worshiped God? The high places were places of worship on elevated pieces of ground. These generally were found on the mountain tops. The Torah describes the high places being dedicated to idol worship (Vayikra / Leviticus 26:30, Bamidbar / Numbers 33:52), just as we read of Midian and the Moabites according to Parashat Balak. (Isaiah 16:12), note how Balak brought Bilam to the high place to see Israel and make sacrifices. In the Neviim (Prophets), we read of Israel worshiping God in the high places too. In the case of idolatry, these places often included an altar and a sacred object such as a stone marble foundation, a pillar or wooden pole in various shapes identified with the object of worship (e.g. animals, constellations, goddesses, and fertility deities, etc). The Neviim section of the Tanach describe the high place as being set up in a spot that had been artificially elevated. The author of 2 Kings 16:4 makes a distinction between the high places and the hills. The prophet Jeremiah writes of Israel turning away from the God of Israel to practice Molech worship and so the people built high places for Baal (Jeremiah 32:35 And they built the high places of Baal, which are in the valley of the son of Hinnom, to cause their sons and their daughters to pass through the fire to Molech; …). We also read of King Solomon towards the end of his life built idolatrous high places for his foreign wives outside of Jerusalem and worshiped with them, causing his children to loose the kingdom (1 Kings 11:11). The people were still sacrificing at these high places before the temple was built, and Solomon joined them. After the Lord appeared to him in a dream at Gibeon, the king returned to Jerusalem and sacrificed offerings; however, he continued to waver between the two places of worship. As we study the high places described in the Tanach, not all high places were dedicated to idol worship. These high places also played a major role in Israelite worship, and the earliest biblical mention of a site of worship as a “high place” is found in Bereshit / Genesis 12:6-8 where Abram built altars to the Lord at Shechem and Hebron. Abraham built an altar in the region of Moriah and was willing to sacrifice his son there (Bereshit / Genesis 22:1-2). The Rabbis believe this to be the same high place where the temple of Jerusalem was built. Jacob set up a stone pillar to the Lord at Bethel (Bereshit / Genesis 28:18-19), and Moses met the Lord on the mountain of Sinai (Shemot / Exodus 19:1-3). The high places were visited regularly by the prophet Samuel (1 Samuel 7:16). The high places were known as sites of Canaanite idol worship (Judges 3:19) which extended on into the period of time that Elijah was a prophet over Israel (1 Kings 18:16-40). The Lord God chose only one place as His high place where sacrifice was authorized, and that was the temple in Jerusalem (2 Chronicles 3:1). The Lord commanded that all other high places be destroyed. King Josiah destroyed them in 2 Kings 22-23. These high places were warned about in the Torah because they were a localized or regional center of worship that was dedicated to a god. Worshiping at these places included making sacrifices, burning incense, holding feasts or festivals, and sexual immorality. (1 Kings 3:2-3, 12:32). These high places contained altars, graven images, and shrines (1 Kings 13:1-5, 14:23, 2 Kings 17:29, 18:4; 23:13-14). Based upon what we read in 1 and 2 Kings, the presence of the “high places” served as a type of litmus test for Israel’s morality and dedication to the Lord God of Israel. When the kings built these worship sites, the people forsook the Lord for foreign gods. When the people listened to the Lord and removed these places, the Lord was pleased and promised His presence would remain with them (2 Kings 18:3-4, 22:2, 23:4-27). A song of ascents. I will lift up mine eyes to the mountains (Ps. 121:1). Scripture alludes here to the verse Who art thou, O great mountain before. Zerubbabel? Thou shalt become a plain (Zech. 4:7). This verse refers to the Messiah, the descendant of David. Why was he called a great mountain? Because he will be greater than the patriarchs, as is said: Behold, My servant shall prosper, he shall be exalted and lifted up, and shall be very high (Isa. 52:13). He shall be exalted above Abraham; lifted up above Isaac; and shall be very high above Jacob. He shall be exalted above Abraham, concerning whom it is said: I have lifted up my hand unto the Lord (Gen. 14:22); lifted up above Moses, of whom it is said: That thou shouldst say unto me: Carry them in thy bosom (Num. 11:12); and shall be very high like the ministering angels, concerning whom it is said: As for their wings, they were high (Ezek. 1:18). Hence Scripture says: Who art thou, O great mountain? The rabbis say David lifting his eyes up to the mountains is alluding to his looking for the Messiah of God. Here the rabbis describe the Messiah, the one who is identified as the descendant of David, will be greater than the patriarchs. This provides the people with a future expectation of the majesty of the Messiah and the high level of work that He will perform while He is here amongst His people. The Midrash states the Messiah is great because He will be lifted up, raised up for all to see. This parallels John 3:14 And as Moses lifted up the bronze snake on a pole in the wilderness, so the Son of Man must be lifted up, English Standard Version And as Moses lifted up the serpent … and in John 12:32 So Jesus said, “When you have lifted up the Son of Man, then you will know that I am He, and that I do nothing on My own, but speak exactly what the Father has told me … (NASB) Yeshua told us the thing that was about to happen before it had happened. This is an indication that He was doing what the Lord God in heaven wanted him to do. It is in this way when we humble our lives to live and walk according to His Torah, we can know that we are doing what the Lord God in heaven wants for us to do. David answers his question saying, ב עֶזְרִי מֵעִם יְהֹוָה עֹשֵֹה שָׁמַיִם וָאָרֶץ: 121:2 My help comes from the Lord, Who made heaven and earth. (NASB) When David looks to the mountains, he thinks of the Lord God of Israel, of His mighty works to deliver Israel, and His power to work in the hearts of men. This is illustrated in Midrash Rabbah on Bereshit / Genesis Parashat 68 Part 2. Rabbi Yosi states that the Lord is busy at work matching men and women for marriage. Note how the slaver master states dismissively that she is able to do match making of couples for marriage from among her slaves. The rabbi says however that it may seem easy for you to do, but for the Lord it is as difficult as splitting the Sea (Parashat Beshalach). What the Lord does in match making has very intimate implications. The heart of a man and woman must fall in love. There is something about love and intimacy that are a difficult thing to match. For example, some people tend to be attracted to an emotionally unavailable person who is emotionally protected and difficult to get close with, or another person may have a history of pushing away the sort of person who is available, caring, and easy to get close with? The process of connecting and disconnecting occurs in different ways for different people. The issues that may occur between men and women are overworking, criticizing, interrupting, withdrawing, alcoholism, withholding your opinion, taking on too much responsibility, lying, keeping secrets, finding fault, withholding affection, etc. It is not difficult to see the intricacies of life and the behaviors that may spoil a relationship. These very same things parallel our relationship with God and His Messiah Yeshua. These things may be considered disconnecting behaviors and are deeply rooted problems with ourselves, and this is why Rabbi Yosi says the match making process is as difficult as splitting the Sea. We should not be too dismissive in our understanding on how the Lord is working in our lives or in the lives of others. David states in his Psalm saying, ג אַל-יִתֵּן לַמּוֹט רַגְלֶךָ אַל-יָנוּם שֹׁמְרֶךָ: ד הִנֵּה לֹא יָנוּם וְלֹא יִישָׁן שׁוֹמֵר יִשְֹרָאֵל: 121:3 He will not allow your foot to slip; He who keeps you will not slumber. 121:4 Behold, He who keeps Israel Will neither slumber nor sleep. (NASB) The Lord does not slumber or sleep. Though it may seem as if the Lord does not answer when we pray, David reassures us the Lord is not asleep as some would suggest. Tehillim / Psalms 121:3 describes the Lord’s continual concern for us, just as David says, “He who keeps you will not slumber.” In the context of this psalm, the writer makes it clear the Lord is diligent in sleeplessness for our good. Verse 5 says, “The Lord is your keeper.” The concept here is the Lord God of Israel keeps us, protects us, and cares for us. Our Protector is constantly seeking our good. On the other hand, the Tanach describes false gods sleep, according to 1 Kings 18:27 “Either he is musing, or he is relieving himself, or he is on a journey, or perhaps he is asleep and must be awakened.” In the story of Elijah on mount Carmel, he challenged the priests of Baal and they all gathered together to see which god would answer by sending fire to consume the offerings. When the priests of Baal called out nothing happened. And so Elijah taunted them asking whether Baal was asleep? In our case, the One true God may seem to be asleep, in the sense that the Lord doesn’t appear to hear our prayer. Note, David does say according to Tehillim / Psalms 44:23, “Awake! Why are you sleeping, O Lord? Rouse yourself! Do not reject us forever!” indicating there are times when we struggle with the Lord in prayer and with His will and timing. When we sleep we are weak and vulnerable and this is why in the Tanach we read of the watchman who stayed up during the night to watch over the people from her enemies. We also know the darkness is a parallel to evil, and so the night time is a time in which the wicked (ungodly) move about to sin. As a result we are susceptible to attach from the enemy, and so the Lord does not slumber but remains awake to protect us. Because of this we do not need to fear, but can have peace. Tehillim / Psalm 91:5 states, “You will not fear the terror of the night …” because the Lord is our refuge and fortress; our shelter. The psalm continues saying, ה יְהֹוָה שֹׁמְרֶךָ יְהֹוָה צִלְּךָ עַל-יַד יְמִינֶךָ: ו יוֹמָם הַשֶּׁמֶשׁ לֹא-יַכֶּכָּה וְיָרֵחַ בַּלָּיְלָה: ז יְהוָה יִשְׁמָרְךָ מִכָּל-רָע יִשְׁמֹר אֶת-נַפְשֶׁךָ: 121:5 The Lord is your keeper; The Lord is your shade on your right hand. 121:6 The sun will not smite you by day, Nor the moon by night. 121:7 The Lord will protect you from all evil; He will keep your soul. (NASB) David says the Lord keeps us in times of trouble. We are able to sleep peacefully knowing that the God of Israel is protecting us. Note how this is described in the psalms, “I lay down and slept; I woke again, for the Lord sustained me” (Tehillim / Psalm 3:5) and “In peace I will both lie down and sleep; for you alone, O Lord, make me dwell in safety.” (Tehillim / Psalm 4:8) In addition, the Lord may speak to us during the night as David wrote in Tehillim / Psalm 16:7 saying, “I bless the Lord who gives me counsel; in the night also my heart instructs me,” and as Job wrote in Job 35:10 saying, God gives “songs in the night.” And in Job 33:15-16 saying, “In a dream, in a vision of the night, when deep sleep falls on men, while they slumber on their beds, then God opens the ears of men and terrifies them with warnings.” David writes of the Lord speaking to us in dreams saying, Tehillim / Psalm 127:2 “It is in vain that you rise up early and go late to rest, eating the bread of anxious toil; for he gives to his beloved sleep.” (ב שָׁוְא לָכֶם | מַשְׁכִּימֵי קוּם מְאַחֲרֵי-שֶׁבֶת אֹכְלֵי לֶחֶם הָעֲצָבִים כֵּן יִתֵּן לִידִידוֹ שֵׁנָא:) This last phrase speaks of the Lord giving to his beloved while he sleeps. Note how the Lord is busy with providing for our needs even while we sleep. When we consider all this we can understand a Midrash on the words: ועשו לי מקדש, which otherwise is difficult to understand. The Midrash quotes G’d as saying to Israel: “You are My flock, and I am your shepherd.” This is based on Psalms 80,2: “Give ear, O shepherd of Israel.” Construct a dwelling for the shepherd so that he can come and guard you. This is why the Torah says: “They shall make a Temple for Me and I shall dwell amongst them.” G’d said to Israel: You are a vineyard, since we have a verse “For the house of Israel is a vineyard of the Lord of Hosts” (Isaiah 5,7). I am the guard (of the vineyard) says G’d, for we have a verse telling us “the guardian of Israel neither sleeps nor slumbers” (Psalms 121,4). G’d said: “Make a hut for the watchman so that he will watch over you.” G’d also said: “You are children and I am your father.” We have a verse in Deut. 14,1: “You are children of the Lord your G’d.” We also have a verse showing that G’d is our father, in Jeremiah 31,8: “For I have been a father to Israel.” It is an honor for the father to be found near his children, and it is an honor for the children to be near their father, as we know from Proverbs 17,6: “Grandchildren are the crown of their elders. G’d said: “Make a Temple for Me!” Thus far the Midrash. The rabbis are speaking of the Lord commanding the people to make for Him a Mikdash (Tabernacle), a holy place that He may dwell in their midst. This is connected to the Lord being a shepherd to His people. The midrash parallels the people to a vineyard in which the Lord takes care of and prunes, guards, takes care of, waters, feeds, and protects from enemies who might steel the fruits of the people. The rabbis say “It is an honor for the father to be found near his children, and it is an honor for the children to be near their father, as we know from Proverbs 17,6: “Grandchildren are the crown of their elders. G’d said: “Make a Temple for Me!” Thus far the Midrash.” To stand along side of your dad in a way which shows respect for both the dad and the son is a very honorable thing based upon this midrash. The concept here is the Lord protects us, helps us in our burdens and removes our anxieties. We are able to let go and rest because the God of Israel is busy working on all this even as we rest. The Lord is taking care of us 24/7 with no sleep, and no vacations where the point of all this is to say that the Lord is always there for us! The Lord is great in power that He does not need rest, and He is merciful on our behalf to work even while we sleep. It is for these reasons we are thankful and are able to give praise to the Lord because we serve a powerful and good God. This is the meaning behind David’s words of the sun not smiting during the day nor the moon by night? The verse is not speaking about any harm from the sun or the moon, but instead speaks to harm that occurs night and day; in this respect, the psalmist speaks to divine protection during the time of the sun (day time) and the time of the moon (night time). He does not slumber nor sleep. ואף הוא ביטל את המעוררים מאי מעוררים אמר רחבה בכל יום ויום שהיו עומדים לוים על דוכן ואומרים (תהלים מד, כד) עורה למה תישן ה’ אמר להן וכי יש שינה לפני המקום והלא כבר נאמר (תהלים קכא, ד) הנה לא ינום ולא יישן שומר ישראל אלא בזמן שישראל שרויין בצער ועובדי כוכבים בנחת ושלוה לכך נאמר עורה למה תישן ה’ § The mishna further taught: He also nullified the actions of the awakeners. The Gemara poses a question: What are awakeners? Raḥava says: On each and every day when the Levites stood on the platform in the Temple they would say: “Awake, why do you sleep, O Lord?” (Psalms 44:24). Therefore, they were called awakeners. Yoḥanan the High Priest said to them: Does the Omnipresent sleep, that you call upon Him to awaken? But isn’t it already stated: “Behold, He that keeps Israel neither slumbers nor sleeps” (Psalms 121:4)? Rather, when the Jewish people are in a state of suffering, and the nations of the world are in a state of calm and serenity, it is with regard to this that it is stated: “Awake, why do you sleep, O Lord?” If the verse were to be recited every morning it would be interpreted in the wrong way, so Yoḥanan the High Priest therefore canceled the daily recitation of this verse. The Mishnah records the priests at one point used to call upon the Lord to wake up from His slumber. The point is when God’s people are suffering, it is often asked where is the Lord, and why does He not answer our prayers. The Mishnah records that the high priest canceled the job of the awakeners. The reason was to inspire faithfulness in the priests and the people, to be faithful the Lord always hears our cry for help. David concludes his psalm saying, ח יְהוָה יִשְׁמָר-צֵאתְךָ וּבוֹאֶךָ מֵעַתָּה וְעַד-עוֹלָם: 121:8 The Lord will guard your going out and your coming in From this time forth and forever. (NASB) It is important to remember how David and his men conducted themselves while coming in and going out. Soldiers at war were required to be sanctified (Joshua 3:5, 7:13), and we know that the process of sanctification required a temporary celibacy (Shemot / Exodus 19:14-15). It is not that women are inherently evil, but that lust and its effects upon the heart may lead to all sorts of evil, and keeping one’s self from immorality was an important criteria for going before the Lord and seeking that His presence would go with us. We read of this in 1 Samuel 21 when David answers the priest that he and his men have kept themselves from women, and then the priests gave them the consecrated bread to eat. Ein Yaakov’s commentary states the following concerning Tehillim / Psalms 121:8. Ein Yaakov makes a comparison to this verse of the Lord guarding us during our going out and coming in to military men who were sent from Rome to bring a man to Rome, but all of those Caesar sent became proselytes. The Torah states, Shemot / Exodus 13:21, כא וַיהֹוָה הֹלֵךְ לִפְנֵיהֶם יוֹמָם בְּעַמּוּד עָנָן לַנְחֹתָם הַדֶּרֶךְ וְלַיְלָה בְּעַמּוּד אֵשׁ לְהָאִיר לָהֶם לָלֶכֶת יוֹמָם וָלָיְלָה: כב לֹא-יָמִישׁ עַמּוּד הֶעָנָן יוֹמָם וְעַמּוּד הָאֵשׁ לָיְלָה לִפְנֵי הָעָם: 13:21 The Lord was going before them in a pillar of cloud by day to lead them on the way, and in a pillar of fire by night to give them light, that they might travel by day and by night. 13:22 He did not take away the pillar of cloud by day, nor the pillar of fire by night, from before the people. (NASB) This is described as the Lord going before His people in truth. This is paralleled to the men becoming proselytes because the Word of truth goes before God’s people. This is why the man had such great success while speaking to these men of war, the Lord worked in their hearts to overcome their past and start in newness of life. This is the way the Lord works in our lives, changing us from the inside out so that we have a desire to walk in His ways of righteousness, justice, and truth. Has the Lord been working in your life in this way? Obviously the Lord is part of our lives, otherwise we would not be here reading a commentary on the psalms. But when we ask ourselves what the Lord has been doing in our lives, it forces us to stop and examine our ways. It forces us to think about what the Lord is doing, where He is leading us, and also what we are doing that He is not leading us to do. What the psalmist writes should challenge us as he says ח יְהוָה יִשְׁמָר-צֵאתְךָ וּבוֹאֶךָ מֵעַתָּה וְעַד-עוֹלָם: 121:8 The Lord will guard your going out and your coming in From this time forth and forever. (NASB) How is the Lord guarding your life on a daily basis? This is both an encouraging and challenging verse. Should we only be able to look may years back into our lives to see how the Lord has worked? Can we look in these last few moments, hours, or days to see how He is working and leading us in His ways? This is the definition of repentance, having a change of mind that leads one to walk away from sin and not do it again. This change of mind and attitude, the change of perspective, results in a change in behavior. It means turning from the life of disobedience (sin) that is contrary to God’s Torah, to a way of life that is defined by God’s Torah. Repentance means to surrender our lives, mind, body, and soul, to the will of God according to His word. When we consider the Torah and its purpose, to direct us back to the ways of righteousness, and to cause us to recognize our need for a savior, we realize the truth of what repentance means for God’s people. According to the Apostle John, he wrote of “the transgression of the law” in 1 John 3:4. as “the transgression of the law” (KJV). The Torah describes both positive and negative commands (e.g. “you shall not do…”). On the positive side, repentance means turning to righteousness through a life of faith and obedience. The rabbis recognize that many of the mitzvot in the Torah are negative (e.g. “you shall not do…”). This however provides us with an opportunity, because each negative command has a positive side. For example, the command forbidding the worship of false gods means “Worship the true God.” The command against idolatry means “Worship God in spirit and in truth.” The command forbidding taking God’s name in vain means “Praise His name, and bring honor to His name by your good example.” The commandment against murder means “You shall cherish the gift of life” and especially the life of your brother and even your enemy. Let’s Pray! The Rabbinic Commentary (Midrash) on Tehillim / Psalms 121 has 3 parts. Reading through the Midrash we will be looking at Part 1, 2 and 3. Let’s begin by outlining Midrash Tehillim Chapter 121, Parts 1, 2, and 3. The משל (mashal) “the parable,” goes on to explain the פתיחתא (Petihta), the rabbis speak of David’s words seeking help from the Lord and looking to the mountains. The נמשל (Nimshal) “expansion on the parable” expands upon the משל (mashal), with a discussion on how the Lord helped the people one last time but do not have a future expectation of being helped again. The משל (mashal) “the parable,” goes on to explain the פתיחתא (Petihta), the rabbis discuss The Lord keeping the people from slipping in sin that leads to Gehenna. The נמשל (Nimshal) “expansion on the parable” expands upon the משל (mashal), with discussion saying when the wicked go to Gehenna, Israel will not slip because the Lord is with them. The משל (mashal) “the parable,” goes on to explain the פתיחתא (Petihta), the rabbis ask the question of whether there is sleep in heaven? The נמשל (Nimshal) “expansion on the parable” expands upon the משל (mashal), with discussion with examples on how the Lord does not sleep. א שיר למעלות אשא עיני אל ההרים וגו׳. דוד אמר שיר למעלות משנתת עלינו מעלה זו אין אנו יורדין, משיושיענו ממלכות עשו שוב אין אנו יורדין עוד לשעבוד מלכות, שנאמר ועלו מושיעים וגו׳ (עובדיה א כא), אומרים ישראל להקב״ה אנו נאמר לך שירה על אותה מעלה שהעליתנו מן המלכות, לכך נאמר שיר למעלות אשא עיני וגו׳. מהו אל ההרים. יום שיבא הקב״ה בדין וישראל מסתכלין באבות שידברו עליהם זכות, ואין אב שימלט את בנו, ואין איש שימלט את אחיו, באותה צרה ביום הדין, באותה שעה נושאים את עיניהם לאביהם שבשמים ואומרים כי אתה אבינו כי אברהם לא ידענו וגו׳ (ישעיה סג טז). עזרי מעם ה׳ וגו׳. כך אמר הקב״ה לישראל אתם יודעים מי עוזר אתכם, עושה שמים וארץ. 1. A son to ascents. I will lift up my eyes unto the mountains, from whence will my help come? 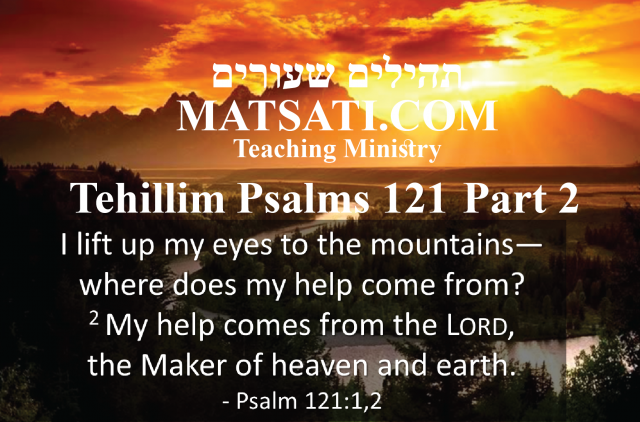 My help comes from the Lord (Tehillim / Psalms 121:1). David said, A son to ascents. After You have taken us up the last ascent, we will not be brought down. That is to say, after God saves us from the kingdom of Esau, we will not again be degraded in servitude to the kingdoms, as is said, And saviors will come up on Mount Zion to judge the Mount of Esau; and the kingdom will be the Lord’s (Obadiah 1:14). The children of Israel said to the Holy One blessed be He, To You we will sing a song of the last ascent whereto You will raise us from among the kingdoms. Hence, it is said, A song to ascents. I will lift up my eyes unto the mountains, etc. What is meant by unto the mountains? It means that on the day when the Holy One blessed be He, comes to judge mankind, the children of Israel will look unto the fathers to plead for them, but no father will be able to save his son and no man will be able to save his brother. In their time of distress, on the day of judgment, the children of Israel will lift up their eyes to their Father in heaven, and say For You are our Father; for Abraham knows us not, and Israel does not acknowledge us. You, O Lord, are our Father, our Redeemer from everlasting is Your name (Isaiah 63:16). My help comes from the Lord, who made heaven and earth (Tehillim / Psalms 121:2). The Holy One blessed be He, said this to Israel, Do you know who will help you? He who made heaven and earth. What do the rabbis mean “After You have taken us up the last ascent, we will not be brought down?” Tehillim / Psalms 24:3 states, 24:3 Who may ascend the mountain of the LORD? Who may stand in his holy place? (NIV) The midrashic answer to this question is “That is to say, after God saves us from the kingdom of Esau, we will not again be degraded in servitude to the kingdoms, as is said, And saviors will come up on Mount Zion to judge the Mount of Esau; and the kingdom will be the Lord’s (Obadiah 1:14).” This type of ascension is in reference to the Lord delivering His people from the kingdoms of the earth. In the Apostolic Writings, we find the meaning of ascension as a reference to something that raises us in faith, hope, and charity. Yeshua said to Thomas, “Have you come to believe because you have seen me? Blessed are those who have not seen and have believed” (John 20:29). What we find here in the events following the Messiah’s death, was his resurrection and then his ascension to the Father in heaven. Then we find Yeshua revealing himself to the disciples. Having seen Yeshua, and Thomas putting his hands in Yeshua’s hands and in his side, Thomas believed. Yeshua then said, “Blessed are those who have not seen and have believed” (John 20:29). The idea of ascension produces hope and faith, since Yeshua has gone to the place that was promised for those who remain faithful. The Lord promised us His Holy Spirit to come and dwell in us, which will endue us with power, and a fire for His love, urging us to love the Lord God our Father in heaven and to love others. We read in the Apostolic Writings, Yeshua told the disciples at the Last Passover meal, “My children, I will be with you only a little while longer. You will look for me, and as I told the Jews, ‘Where I go you cannot come,’ so now I say it to you. I give you a new commandment: love one another. As I have loved you, so you also should love one another. This is how all will know that you are my disciples, if you have love for one another” (John 13:33-35). Yeshua speaks of his ascension where they will not be able to follow. Yeshua is speaking of a mystery here of being united with the Messiah and with our Father in heaven, both spiritually and physically. There is a distance between man and our Father in heaven, that no human effort, holiness, or righteousness, is able to overcome. The midrash continues saying, “The children of Israel said to the Holy One blessed be He, To You we will sing a song of the last ascent whereto You will raise us from among the kingdoms. Hence, it is said, A song to ascents. I will lift up my eyes unto the mountains, etc.” Note how the rabbis discuss the Lord lifting up His people above the nations. This is a parallel to what we read in Parashat Ki Tavo. Moshe writes that if we diligently obey the Lord our God, he will raise us up high above all the nations of the earth. The mitzvot (מִצְוֹתָיו) are a blessing. Our Father in heaven gave them to us in order to help us grow and developed qualities as being His children. The Scriptures say we are to live our lives in this way in order for life to go well for us. By keeping God’s commands, His blessing will come down upon us, and it is upon this that we will know the Lord is with us. By choosing to walk in His commands, we are humbling our lives to walk in His ways. This is what it means to be united with the Lord spiritually and physically, taking our lives and walking according to the Spirit. And yet while we have these commands so near to us, the distance that exists between us and God is so great that no human feat, no effort, and no human holiness is able to overcome that distance due to sin. Only the Lord Himself is able to forgive and to draw us near. The most important part is to recognize that if we are to be called the children of Abraham, or even the Children of God, we are to do as Abraham did and live by faith (John 8:39 They answered and said to Him, “Abraham is our father.” Jesus said to them, “If you are Abraham’s children, do the deeds of Abraham. NASB) This also consistent with doing as the Lord God in heaven does, and as the Messiah Yeshua does, to love one another, to live in mercy and peace, and to be forgiving. The midrash quotes from the psalms saying, “My help comes from the Lord, who made heaven and earth (Tehillim / Psalms 121:2). The Holy One blessed be He, said this to Israel, Do you know who will help you? He who made heaven and earth.” In this life we need the help of the Lord, for His empowering to overcome sin, and this comes by faith in His Messiah Yeshua. ב אל יתן למוט רגלך. מהו אל יתן למוט, בשעה שימוטו הכל לגיהנם אתם אינכם מוטים, וכן אמר הכתוב לי נקם ושלם לעת תמוט רגלם (דברים לב לה), כשתמוט רגלם של רשעים אותה שעה אינכם מוטים, שנאמר רגלי חסידיו ישמור (ש״א שמואל א׳ ב ט), וכתיב ברכו (ה׳ כל חסידיו) [עמים אלהינו] (תהלים סו ח) , על איזה דבר אתם מברכין, השם נפשנו בחיים וגו׳ (שם שם תהלים ס״ו ט). 2. He will not suffer your foot to slip (Tehillim / Psalms 121:3). What is meant by He will not suffer your foot to slip? When all men are in danger of slipping into Gehenna, you will not slip. Similarly, the verse, To Me belongs vengeance, and recompense, their foot will slide in due time (Devarim / Deuteronomy 32:35) means that when the foot of the wicked slides, you will not slide, for it is said, He will keep the feet of His holy ones (1 Samuel 2:9). Hence, it is written, O bless our God, you people (Tehillim / Psalms 66:8). For what reason are you to bless God? Because, as the next verse says, He has set our soul in life, and suffered not our foot to slip. שוב מעשה בנכרי אחד שבא לפני שמאי א”ל גיירני ע”מ שתלמדני כל התורה כולה כשאני עומד על רגל אחת דחפו באמת הבנין שבידו בא לפני הלל גייריה אמר לו דעלך סני לחברך לא תעביד זו היא כל התורה כולה ואידך פירושה הוא זיל גמור. There was another incident involving one gentile who came before Shammai and said to Shammai: Convert me on condition that you teach me the entire Torah while I am standing on one foot. Shammai pushed him away with the builder’s cubit in his hand. This was a common measuring stick and Shammai was a builder by trade. The same gentile came before Hillel. He converted him and said to him: That which is hateful to you do not do to another; that is the entire Torah, and the rest is its interpretation. Go study. The Concluding phrase says, “Hence, it is written, O bless our God, you people (Tehillim / Psalms 66:8). For what reason are you to bless God? Because, as the next verse says, He has set our soul in life, and suffered not our foot to slip.” These things are connected to the soul and life not slipping into Gehenna (hell), meaning that we do not slip into sin. If sin can be reduced to our relationship with others and with our Father in heaven, then this truly is the greatest command. This may be why Yeshua taught so often on this central command in the Torah. Loving one another is a central component of who we are as God’s people. It also is a central component of our faith. Surely not. In heaven there is no sleep, nor is there sitting. As Scripture says, I saw in the visions of my head upon my bed, and behold a wakeful one and a holy one came down from heaven (Daniel 4:10), and says also, The matter is by the decree of the wakeful ones (Daniel 4:14). In these verses, the word wakeful proves that there is no sleep in heaven. Why, then, does the Psalmist make a point of saying that He that keeps you does not slumber? Because it would appear from the troubles which come upon the children of Israel in this world that the Holy One blessed be He, was asleep, if one dare speak thus. Indeed, Asaph did say, Awake, why do You sleep, O Lord? (Tehillim / Psalms 44:24). But from the prophets it can be shown that He that keeps you does not slumber. When the Prophets prophesied and wept, saying, If I forgot you, O Jerusalem (Tehillim / Psalms 137:5), should they not have spoken in the plural? It must be concluded that the Holy One blessed be He, was saying to the Prophets, You weep, and was saying through them, I weep with you. Thus the I in If I forget you, O Jerusalem is the Holy One blessed be He, saying, I will not forget you. The rabbinic idea of the Lord not sleeping is when trouble comes, it appears to us the Lord is sleeping, when He in fact is not. The concept of sleep is paralleled to forgetfulness. Here Rome is described as Edom, because Esau rejected the covenant of God, we see the level or state of rebellion in Edom as a grandson of Abraham, and of Rome who does not know the ways of God. The closeness in relationship of Esau to Israel is found in the narrative on his birth, Jacob and Esau were twins. The complexity of Esau (Edom) rejection of the covenant of God is found in the genealogical lists, the ethnic composition of the Edomites, we are told of Esau’s marriages, he married Canaanite-Hittite women (Bereshit / Genesis 26:34, 36:2). We are told that he married Ishmaelite women (Bereshit / Genesis 28:9, 36:3). He also took Hivite wives (Bereshit / Genesis 36:2). These descriptions of Edom’s genealogical lists emphasize the heterogeneous nature of his interactions with the nations, something of which the Lord had forbidden. In addition to this, the complexity of Edomite culture is said to be even greater than these, he also added Kenazite (Bereshit / Genesis 36:15), Amalekite (Bereshit / Genesis 36:16), and Horite (Bereshit / Genesis 36:20-21, 36:29, 36:30) women to the family, which draws in the context of the assimilation of their cultural gods as well. These are found in the genealogical list of Esau’s descendants and in the list of the chiefs of Esau. This is why the midrash emphasizes the parallel between Edom and Rome, and reminding us to remember the Lord, and seeking the Lord to remember His people and the holy place Jerusalem. The gods of Edom were mainly fertility gods, as is evidenced by the numerous clay figures found in Edom. Like Ammon and Moab, Edom had one chief god. Note the way the midrash speaks of Edom and connects this to the destruction of the people, even to the destroying of children who are innocent, as it says “dashing” them as if they would cast their children off the cliffs to destroy them. The midrash states, “Let all the inhabitants of the land tremble, For the day of the Lord comes (Joel 2:1), and says also, The day of the Lord in darkness, and not light (Amos 5:18). Accordingly, God said, I will bring all these days as days of trouble upon the children of Edom on account of the one day they brought upon you.” The children of Edom, this may be paralleled to the children of Abraham. The fruit of this sinful act may be paralleled to being a child of Edom, just as the Apostolic Writings speak of the wicked man being a child fathered by the Devil. John 8:44-45 Ye are of your father the devil, and the lusts of your father ye will do. He was a murderer … the father of it. 45 And because I tell you the truth, ye believe me not… Thus Abraham “believed God, and it was reckoned to him as righteousness.” (Romans 4:3) So by this interpretation it is men of faith who are the sons of Abraham. Jew or Gentile, rich or poor, male or female, white or black or brown, quick-witted or slow, old or young, anyone can be a child of Abraham and inherit the blessings promised to Abraham’s children, if we live by faith. Note something here, the same may also be said of those who do not live by faith but in wickedness, they are called the children of Edom, or sons of the evil one. Anyone can be a child of Edom, a child of wickedness, and of the evil one. The rabbis say the Lord will repay one for what he has done. The consequences of our sins lead to the curses as described in the Torah which apply to the one who sets his course in life to follow after sin. Consider how modern theologies have taught us to ignore the Torah and Moshe’s words on the life of God’s children as it is connected to sinfulness, unfaithfulness, and the curses at the end of the book of Devarim / Deuteronomy. Most modern people and even some in the church would simply shrug their shoulders at this part of the bible. One reason is that they have no idea what it means to be a son of Abraham and no sense of the value of the blessing promised to Abraham’s children. The reason being it is taught the Torah has no place in the lives of God’s people as being an obligatory part of our faith. In the modern world, there are counter-cultures which are teaching people to find their own identity by defining themselves in antithesis to the previous generations. This speaks contrary to what we have going on in the biblical text, we are to remember the previous generations so we do not repeat what they did, we hold fast to the truth of the Lord God of Israel, and we do not have a disdain for the expectations of past generations, because we serve an eternal God who never changes. Popular culture portrays it as cool to reject the bible, and to take hold of witchcraft or some other form of rebellion that is contrary to the biblical values. We are called to take hold of biblical values and to take hold of the Lord God our Father in heaven and His Messiah Yeshua. Let’s Pray!